I hate gossip. Don't get me wrong. I understand it. It's human nature to talk about the people around you. I'm a cop, and I'll readily admit that gossip has helped us crack some cases. It's that old adage "where there's smoke, there's fire." But I've been on the other side of gossip, too. I guess you'd call it being the gossipee -- the one who is gossiped about. Nearly five years ago, my wife vanished. She wasn't there when I came home that night and was never seen or heard from again. You can imagine the anguish. Not knowing what happened to her is the worst. I didn't get much sleep the first year she was missing. Some nights, I still pace the house. I usually end up in the master bedroom. "Our" bedroom. I never slept there again. It's painful for me to go in there and remember Anne. I hold the pillows she embroidered with flowers and ladybugs. I sit in the chair she had upholstered in a soft floral fabric. Maybe it's only wishful thinking, but I can still smell her scent in that room. And it all comes flooding back to me. I wonder if she's dead or alive. If she's hurt. If she's being treated well. It breaks my heart when I hear talk about Vegas's mother disappearing. How could a mother do that to a little girl? How could Anne have done that to me? When daylight arrives, I push thoughts of Anne away so I can function. But Anne is always with me. I still search every crowd for her face. People are cruel. They say things like "he's a cop so he knows how to hide a body." They say I murdered her. That I killed Anne. Sweet, gentle Anne who was happiest puttering around in the garden. I mow the lawn, and I still mulch her garden. There's nothing else I can do for her anymore. My favorite rosebush died. I hope that's not a sign. 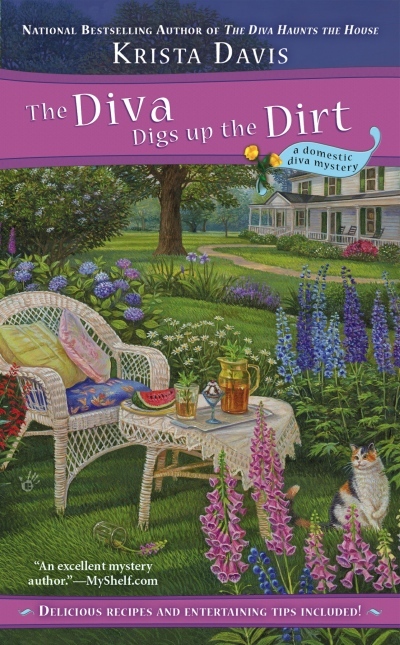 The Diva Digs up the Dirt coming June 5th. Awww poor Wolf. I hope you get your answers soon. I hope you find Anne someday. Love that cover and can't wait for this latest book. Wow, I want answers, and I don't even know her. Must've torn you in two. I hope you find the truth in both cases. Thanks, Victoria. I hope I learn what happened to her. Though I admit I'm a bit afraid. That must be really hard, Wolf. Sooner or later, you'll just have to get on with your life, but you'll always miss what might have been. Opal, I have gotten on with my life. I'm dating Sophie, who is terrific! I don't know how I got so lucky. Anne is always there in the back of my mind, though. I think the gossipers don't like that I'm trying to move on. They think that supports their theory that I killed Anne. A guy just can't win. Thanks, Kari. Anne would have loved that cover. That is so sad and also, frustrating. What a dark cloud to try to come out from under. Hopefully, this will be solved soon. Thank you, Erika. After five years, I don't really expect a resolution. Even hope fades eventually. Wolf, I'm so sorry for your loss. It's heartbreaking losing someone you love and never knowing if you could have done something to prevent it. Don't worry about what people think. I believe you are innocent and time should prove that. Also, it's time for you to move on. I do hope you'll continue to adore Sophie. She is the best.